I’m a super crafty person, but I’m not a pro at everything DIY. And when it comes to sewing, I need all the hacks I can get. I’m a perfectionist, so if I feel like I won’t be able to keep a straight line when sewing or my stitches will come undone, I get a bit nervous. But thankfully there are plenty of bloggers out there who have found some awesome tips to help us out. So whether you’re new to sewing or a seasoned professional wanting to find something new, I’ve accumulated some hacks from awesome lists created by great bloggers. I picked out what tips I thought were the best and then included a link at the bottom for my readers to see the rest of the list. Why do I do this? Well, I love giving my readers the option to click through and see even more awesome hacks and giving credit to the bloggers I found the tips from. So take a look at what I have and feel free to see what others have found as well at the bottom! Alright, so it seems like a given that anyone who sews should know how to install a zipper. But there are plenty of people (like me) who are lost on the art. So the blogger from Notedlist found an awesome tutorial for doing just that. Now this is one creative and colorful way to organize and store your embroidery floss. Definitely an eyecatcher! Alright so the original tutorial for this shows you how to make a ruffle shower curtain, but to be honest, I think this is going to show you a lot on making ruffles. So even if you don’t want to make a shower curtain (even if it looks as awesome as this), you can test out your ruffle skills on some fabric. Now if you have any trouble with sticking the thread into the eye of the needle, just spray it with some hairspray to get the tip to stay straight. Having trouble knowing how to measure your seams on the sewing machine? Well a blogger on Ebay gives seven awesome sewing tools (like a seam measuring gauge ) to help crafty people like you out. Alright so this isn’t really a hack, but it’s definitely helpful when trying to find your keys. Also.. it’s just too pretty not too share. Am I right? Okay, so having steel wool inside of a super cute pin cushion serves two purposes. While it’s keeping your needles in place, it’s also sharpening them. Super cool right? Now if you’re not 5’8 like me and you have a pair of jeans you really like but they’re too long, don’t worry! This blogger found an awesome tutorial on how to hem your jeans but still keep the original hem. Seriously helpful! Alright, so with a few tips and hacks in mind (and a whole lot more sources to go by, I hope I was able to give you some great ideas for getting started on new projects. 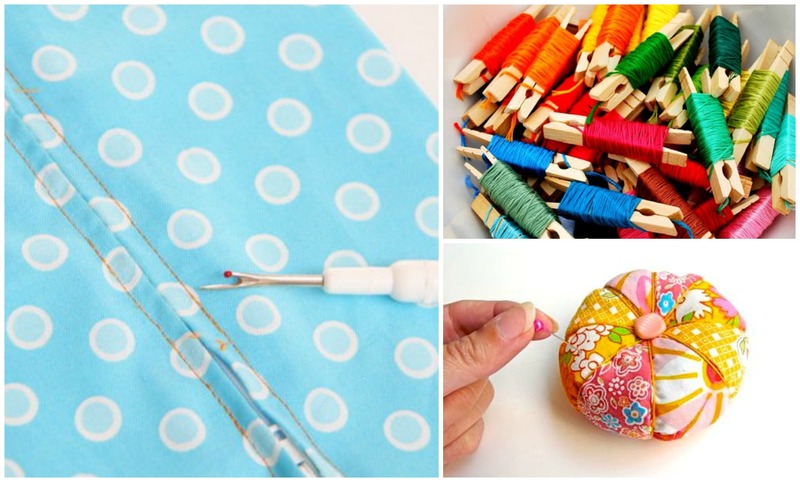 Sewing can look pretty tricky, but with a few tricks yourself, it can become easy. Also, practice doesnt’ hurt. Now if you have any sewing tips and tricks yourself, let me know in the comments below! I’d love to hear about them! I’m. Looking for the Pinterest post about 50 awesome gifts to sew. I’m looking for the bobbin storage ‘thingy’ shown in the pic of the Pinterest pin. Thanks! Judy, I believe it is a toe separator, like for doing pedicures. I didn’t see it in the tips, but I ‘ve seen bobbins stored like that in other posts. Loved all of these. Thanks for sharing. Maybe use loosely crumpled up aluminum foil instead of steel wool to keep it from splintering thru?? I’m looking for the bobbin storage thingy too! At 6:40 a.m. your blog is exciting me! I’m looking forward to more great hints and information. Thanks for taking the time to help all of us.